This was how the slightly dishevelled 38-year-old think-tanker bantering cheerfully with the photographer, found himself being subjected to rigorous questioning on the premise and extrapolations of a book that has sold 2,000 copies in the first month, a bestseller by Malaysian standards. First the cover, of the intense, unobtrusive Pramoedya Ananta Toer-like glare. “He is Majid Abdul Rahman, 89, a farmer in Bukit Pinang, Kedah,” said Dr Muhammed, a somewhat excitable, altogether charming member of the intelligentsia with a mission and a PhD from Institute d’etudes Politiques de Paris, checking his notes stored in his phone. His 25th-floor office overlooks an old section of Kuala Lumpur. His thoughts are new, mining more data than many of his predecessors in the genre, perhaps one started by James Puthucheary’s Ownership and Control in the Malayan Economy. That particular study preceded the launch of the New Economic Policy that Muhammed argues has not been in vain. Inequality among Bumiputera dropped by 10 per cent while overall inequality dropped from 0.513 (in the Gini coeficient) to 0.421 this year. So the argument that NEP widens overall inequality, and Bumi inequality, are clearly not backed by data. The youngish author has also highlighted instances of social bias in employment against the Malays in the same manner as the Chinese in Australia, Arabs in Europe and people of African origins living in the United States; and that the magnitude of brain drain is exaggerated, with Singapore experiencing a more severe loss of talent. Not reticent about stacking up the negatives or rather concerns, Muhammed’s anxiety list begins with last year’s Amanah Saham Bumiputera numbers, revealing that 72 per cent of unit holders owning an average of RM554 each with the top 0.2 per cent accumulating 1,309 times more at RM725,122. More than half of Malaysians — 53 per cent — have no financial assets and one in every four Malaysians has no property assets. Today, as a gathering at Teluk Senangin (Lumut) of these four soul-mates, born in 1961 and 1962, and their batch mates from Sultan Abdul Hamid College, Alor Star, gets underway, at a time of their self-actualisation stage, Muhammed’s findings shall earn a considerable airing. Rosli, the sepak takraw star, now an earnest history teacher, will parade composure. Yesterday, he delivered at a mosque in Baling a movingkhutbah on the last moments before death (Sakaratul maut). His career choices and country living have had just rewards. Friends to his fine house would be treated to sumptuous meals topped with doses of a special honey. Ariff would listen attentively. He was the hockey captain who now resembles, tantalisingly, the late footballer Isa Bakar, whipping up these days arguably the best ABC in Sungai Petani. He is the envy of his peers. He lives in a semi-D home not too far away from his mother’s place in Sungai Petani that has merged in scales of ambition and expansion with Penang. He is a regular at the local surau. Since 1981, when the remnants of a flowing 1974-75 batch finally left school, he has been the undisputed ziarah (loosely translated as keeping-in-touch) champion. The other day when the revered Ustaz Ahmad Mahadi Mehad passed away in Alor Star, leaving a permanent hole in the collective consciousness, for this was the ever inspirational mentor, Ariff rushed back in time to Kedah from Lumut where he was visiting his navy brother and a dear friend. Salihin, who treats his power plant job lovingly, routinely seen trying to answer calls to two phones at once and named a son, Ariff. Azhar would be the standout worker for a certain political party regardless of the tone and depth of any arguments. It is part-hereditary, part-duty perhaps. His house in the plains of Kedah, within earshot of the azan from the local pondok, shall inevitably function as the local operations centre come election time. He displays no contempt whatsoever to friends from the opposing party. This clan may or may not take up the suggestion by the award-winning architect, Kamaluddin, in their WhatsApp group, to launch some kind of a cooperative. Anuar is in food business, serving packets occasionally to the homeless. He is certain to back the idea. HW, who signs your car-financing applications at a leading lender, will probably caution against the cost of the envisioned set-up. A certain Using, who journeyed to the west coast from Kerteh, a good few days before the gathering must have achieved like his friends, the parenting KPI — the kids have bettered the academic markers. The author Muhammed, at the Friday morning interview, offered some advice to gatherings of this nature — find your way into discussions that would shape policy thinking. The words of Pak Majid featured in the cover, must have greatly influenced this suggestion. The grand old man of Bukit Pinang spoke of his own worries of Hilang Dalam Olak. Those Googling the meaning and finding definitions of Olak in Hindi and Serbo-Croatian need not panic. Pak Majid has done well as a parent. He now worries about his descendants, fearing like a good patriarch would, of those who come after him not doing too well of being “lost in the whirlpool”. The inadequate financial assets of the average Malaysians presents no real mystery, really. Policymakers and others have long agonised over income levels not keeping up with costs, hence the emphasis on the bottom 40 per cent in the high-income society pursuits. Muhammed for one backs the PR1MA initiatives as a means of catalysing human talents, among others. He is also a supporter of BR1M “with an exit strategy”. Going forward, perhaps more of the journalistic, in-depth interviews with ordinary Malaysians would provide greater insights into the hopes and concerns. In any case, at the Teluk Senangin gathering, Zulkurnain, chairman of the organising committee, shall without a shadow of a doubt highlight the ever pressing needs of life-career balance, to be gregarious at all times (to have a good meal, too) — prerequisites of thinking through even the most daunting issues. 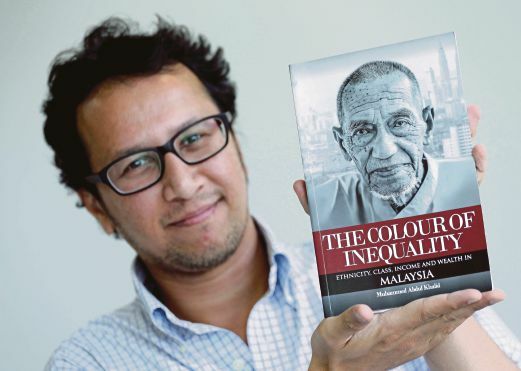 Dr Muhammed Abdul Khalid with his book, ‘The Colour Of Inequality Ethnicity, Class, Income And Wealth In Malaysia’.